This Adorable Pup Is Wearing Shoes For The First Time! Too Cute And Funny! We all wear shoes for a reason. The ground can be incredibly unforgiving to our feet, so some degree of protection has always been desired since ancient times. On top of that, specialized shoes can help us traverse our environments in ways we otherwise couldn’t! As a result, you probably can’t help but ask yourself: Why not get your pup some shoes too? Surely walking around on the ground in extreme temperatures can’t be comfortable for them! And you would be absolutely correct. 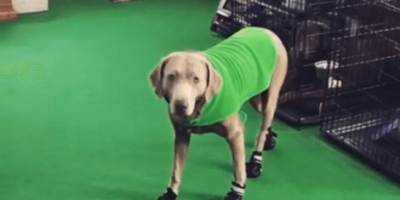 Which is why this Mom has opted to get some shoes for his Labrador Retriever, Jake! Jake, obviously finds these shoes incredibly strange. What happened to the floor? He can’t feel it anymore! Each step is a tentative, awkward one. It is going to take him a while to get used to them. But that is okay, especially with Mom encouraging him every step of the way! Watch How This Adorable Pup Gently Plays With A Tiny Bunny!